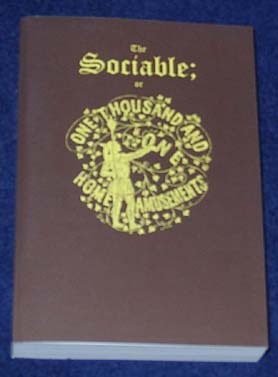 It is hard to tell how happy I was when I discovered that a publisher was reproducing The Sociable. After I had first discovered it, I searched for about three years before I found a copy that was not in special collections at a library and that I was able to put on the copying machine. This book was one of the main sources for my book on Nineteenth Century Parlor Games. This is the most comprehensive collection of civil war era entertainments available. The activities range from very simple parlor games through feat of magic and card tricks to parlor theatricals, charades, and tableaux vivants. These latter two may need some explanation. Charades played in the style of the 1850's and 1860's consisted of a short play with as many scenes as there were syllables in the word plus one. Each scene would depict one syllable and then the last scene would provide a clue to the entire word. Tableax vivants were referred to as "living statues." The curtain would remain closed while the actors took their positions in portraying a scene frozen in a moment of time. The curtain would open and a narrator would describe the scene or a sign would give the title of the scene, all the time the actors would not move or say a word. The curtain would then close. Popular subjects for tableaux vivants were moral virtue, e.g., temperance, patriotic themes, or historical scenes. Someone trying to do all the activities described in this book could probably fill every evening for a month and still not be through the book.